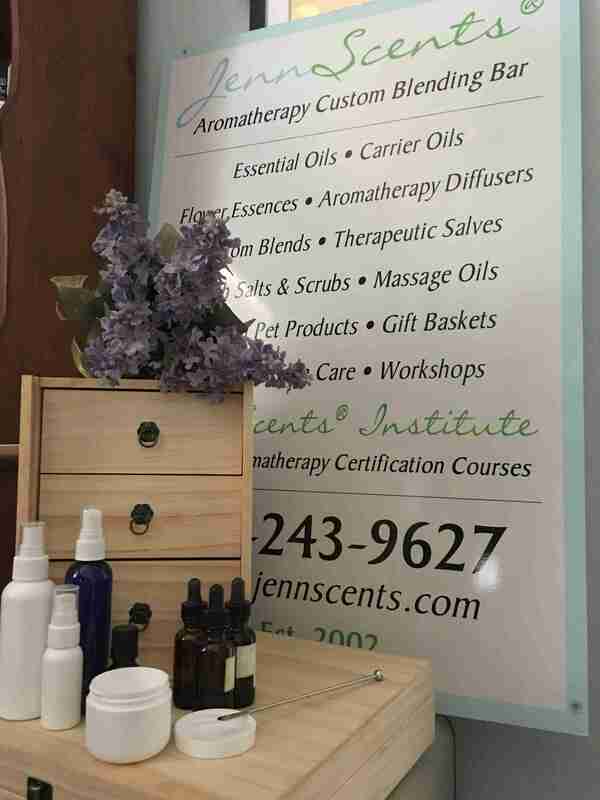 We are excited to be one of the first to offer a Virtual Aromatherapy Custom Blending Bar experience. I began my aromatherapy custom blending bar in 2002, at a local herb shop in my hometown. There was nothing like it and it really happened by accident. It started out with me visiting the shop frequently as I was working on regaining my health. I then came every day and talked with people when they came into the store. I shared that I made me an Intestinal Soother to calm my bowels spasms, cramping and frustrations with being sick. That quickly grew into customers asking me to blend up a remedy for them to solve a health ailment. Before I knew it, I had an aromatherapy custom blending bar. This picture is at my first space. Customers (babies to seniors) would come visit my “bar” to smell some essential oils and have me create a special blend for them based on what they liked. I developed the Olfactory Sensory Testing® technique which had customers smell the oils and rate them on a scale of 1 (yuck)-10 (love it). This would help me formulate, as well as give me insight to emotional struggles they might be having. For me, I always have seen essential oils like people. They each have their own personality. It means something when you love it and when you don’t. Loving it can mean your mind-body really needs that to enhance its operations. When you are not attracted to a scent, it could mean you don’t need it. It can also mean that you are not ready to work on what that oil is trying to do. For example, patchouli is great to help you connect to those deep areas of hurt and past wounds. It is very beneficial to help you let go of those burdens. If you are not ready to face or address those issues, you may be turned off by the scent. Through this process, and 15 years of experience working with the essential oils day in and day out, I’ve tapped in to one my greatest gifts – Intuitive Guided Blending™. I’ve developed a keen sense of what oils can help someone move into a more balanced (homeostatic) state when combining specific essential oils to match their core constituent. Through a serious of physical, mental and emotional questions, I am able to connect to that person’s energy and formulate a soul blend to help them achieve great happiness, harmony and contentment. It can help someone become more self-aware and self-accepting. It can inspire and motivate you to set authentic goals, to act and react from their authentic core. This is where the I developed the JennScents Virtual Custom Blending Bar. At the JennScents Virtual Custom Blending Bar, you can complete a questionnaire and have me formulate a special blend for you. You can give it a special name and choose your application (spray, lotion, roll-on, 5ml EO concentrate). You can also submit a recipe or list of ingredients for us to create a blend for you. Many people either have box of essential oils they don’t know what to do with, or they don’t have all of the ingredients they need to make up a recipe. Some essential oils can be quite expensive, especially if you don’t use that particular one all of the time. So, this is where the Virtual Custom Blending Bar comes in handy. I keep about 185+ essential oils on hand at all times. I’ve used the same suppliers for 15 years and some of my rare, special essential oils were sourced from around the world by one of my mentors. These are the most exquisite of my oil collection. What are you waiting for? Visit our Virtual Aromatherapy Custom Blending Bar now, and let us create a special, personalized blend for you.